The majority of surveys that IntelliSurvey programs and hosts are on behalf of end clients, so the resulting data is not ours to use and/or publish. However, we do have a research team that periodically conducts its own surveys, and we thought we’d share some results from a study we recently conducted on a wide range of food-related topics. A recent online survey conducted by IntelliSurvey in September 2018 among more than 1,000 adult food lovers in the US revealed some noteworthy results on a relatively new subject: Lab-based meat. Unlike some of the new plant-based meats on the market, this type of meat is actual meat grown from in vitro animals’ cell culture rather than slaughtered animals. Proponents of lab-based meat cite animal welfare, reduction of greenhouse gas emissions, and decreased chance for food-borne illnesses as some of its advantages over traditional meat. 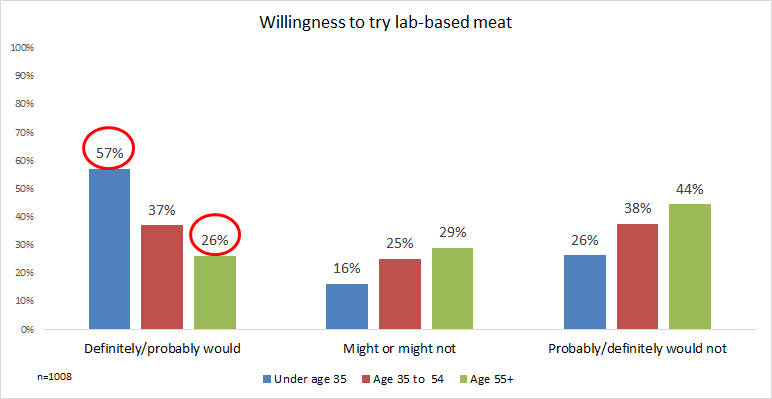 When asked how willing they’d be to try this type of meat, more than twice as many of those in the age 18-34 cohort vs. those age 55+ indicated that they probably or definitely would try it (57% vs. 26%). Conversely, a significantly higher 44% of those 55+ said that they probably would not or definitely would not be willing to try this lab-created product, compared to 26% of those under age 35. Until recently, lab-based meat was also often known as ‘clean meat’. However, at a recent industry conference, a group of lab-based meat producers agreed to use the term ‘cell-based meat’ going forward. Although this may be an attempt to prevent unfavorable comparisons with traditional meat (e.g., if lab-created meat is clean, does that imply that traditional meat is dirty? ), the name change is not likely to make the product sound more appetizing to consumers. 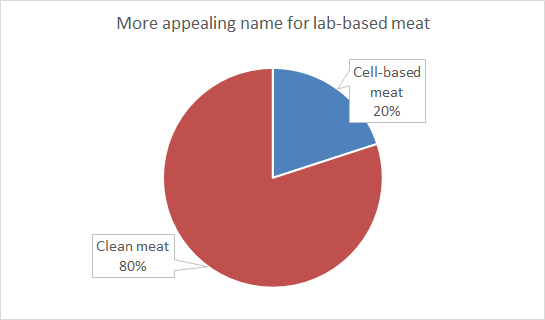 Among the 1,008 survey participants, 80% indicated that they think the term ‘clean meat’ is more appealing than ‘cell-created meat’. The pea protein-based Beyond Burger launched nationally in the U.S. in 2013, while the wheat gluten-based Impossible Burger was introduced in 2016. Both of these veggie burgers are touted as having a taste and texture similar to actual ground beef. 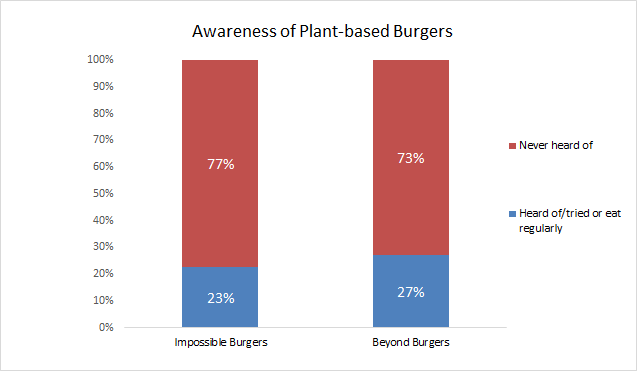 However, IntelliSurvey found that the majority of food lovers who participated in the September 2018 survey were not aware of either burger, with 77% indicating that they had never heard of the Impossible Burger and 73% citing a lack of awareness of the Beyond Burger. The numbers who had either tried or regularly eat each of these burgers were quite low (7% for Impossible Burgers and 8% for Beyond Burgers). For more information on IntelliSurvey’s research services (e.g., project scoping, questionnaire design, field/sampling design and management, analysis and/or reporting of results), please contact Janet Wise (jwise@intellisurvey.com; 413-507-0291).